I usually don’t get a chance to make chole bhatura as my hubby dear is allergic to chana. When I invite guests over, the idea of making chole bhatura never appears to my mind. However, during my very short stay in Bangalore with my daughter, I made chole bhatura. I came across the kabuli chana (white grams) in her kitchen drawer and soaked them immediately. I love chole bhatura but not the overly spicy type. I made the dish after eons. When the kids were at home, I use to make chole bhatura often. I love to have left over bhaturas the next day with a nice cup of masala tea. Yes actually dunking it in the tea….yum. Hope you enjoy this recipe. During our visit to India in Dec 2015, hubby dear broke out into a rash. So he got the full allergy test done. Amazingly it showed that he is not allergic to chickpeas. On returning back home, I first made khadi with chickpea flour and asked my Dermatologist hubby to bring some anti histamine just in case needed it after having the kadhi. Nothing happened. So now I use chickpeas and chickpea flour freely. Lightly roast all the chole masala ingredients in a wide pan or kadai over low heat for 1 to 2 minutes. Keep mixing it so that the spices do not get burnt. Grind the spices to a powder. Add the amchur powder,turmeric powder and asafoetida. Soak the kabuli chana in warm water overnight. Next day, heat the water for tea. When it comes to a boil, add mint leaves and tea leaves or a tea bag. Cover the pan and let the flavours infuse into the water. Strain the water. Drain out the water from the chana. Wash the chana and put it in the pressure cooker. Add enough water to cover the chana, add salt and turmeric powder. Close the lid and cook over medium heat for 3 to 4 whistles. Add mustard and carom seeds. When they begin to sizzle, add the onions. Stir fry till it becomes soft and slightly pink. Add ginger, chillis and garlic. Stir fry for a few seconds. Add tomato puree and let it cook for 2 to 3 minutes. Add the chole masala, chana and water and tea water. Cover the pan.Let the mixture simmer over low heat for 5 to 10 minutes. Garnish with fresh coriander or fenugreek and serve hot with bhaturas. Sieve the flours, baking powder, soda bicarbonate and salt together. Process the bread in a grinder into crumbs. Add the bread crumbs and sugar to the flour mixture. Rub the oil into the flour mixture. Add yogurt and form a dough. Knead the dough into a smooth ball. Smear some oil over the dough. Cover it with a cling film and let it rest for 30 minutes. Heat the oil in a wok or kadai for frying over medium heat. Divide the dough into 12 to 14 parts. Roll each part into a circle (approx. 5″ diameter) using a rolling pin. Fry the bhatura in the hot oil. Once it puffs up, flip it over and let both sides become very light pink in colour. Put the bhatura on some kitchen towels so that the excess oil can be soaked. Repeat steps 9 to 12 using rest of the dough. 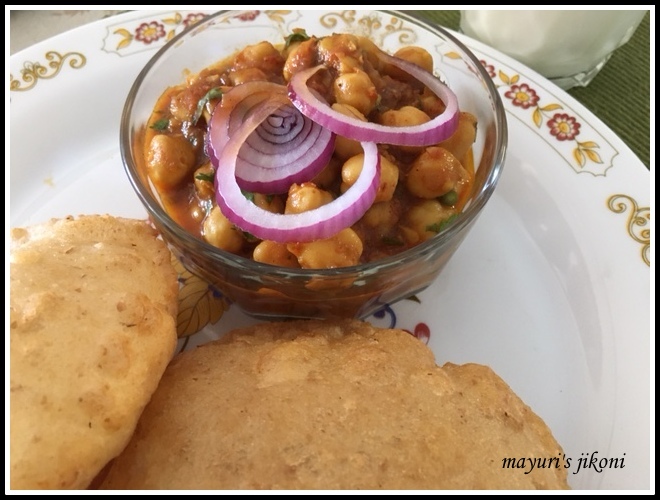 Serve bhatura with hot chole. If the dough becomes a bit soft, use oil or extra flour to roll. Serve chole bhatura along with some onion cut into thin rings or sliced. Adding bread to the flour makes the bhaturas soft. For more gravy add more tomato puree and water. Add finely chopped fresh fenugreek (methi) to the bhatura dough. My husband don't like maido, so don't use that , but I love this combo with khatu athanu. Yummy.